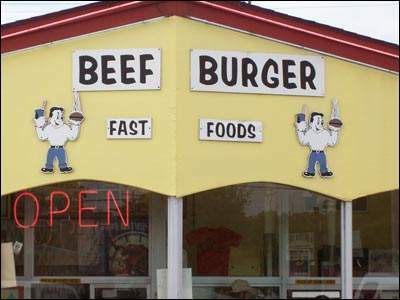 Beef Burger is a fast food restaurant stuck in the fifties. It's not a chain diner trying to re-create the '50s, mind you. There's no attempt to mimic the set of "Happy Days." No ornamental jukebox on display while a CD player in the back plays the "Greatest Hits of the '50s!" No overwhelmingly chirpy staff that greets you at the door with a fake smile that suggests everyone in the '50s was really, really happy about the Cold War. They just haven't redecorated in 50 years. Beef Burger is as straightforward as its name. The burgers mirror their home: simple, a little messy and deceivingly plain-looking. The burger patties themselves aren't bad. They're not particularly impressive; in fact, they are a little on the dry side, but that doesn't matter because they're smothered in the trademark sauce that has kept this joint around for half a century. In a world in which the McDonald's arches are more recognizable worldwide than the Christian cross, competing with the big boys can be more than a bit intimidating. That's why Beef Burger fights dirty. One bite into your cheeseburger, and you'll be making plans to lick up that mouth-watering sauce dripping down your arm. Like an ice cream cone on a hot day, getting through one of these burgers requires careful hand placement and the sacrifice of a few brave napkins. But this is no secret sauce. Beef Burger, in a seemingly suicidal business move, lists the ingredients on its Web site: one can of ketchup, a little bit of mustard, a dash of ground ginger and four ounces of delicious. Best deal of the house? The cheeseburger box: two cheeseburgers, fries and a dollop of coleslaw, which will run you $4.04 with tax - $5.20 if you want a soda. Beef Burger's crinkle-cut fries, cooked to perfection, don't need ketchup. The coleslaw has that hint of sweetness reminding you that in North Carolina, we can't even eat salad without mixing in some sugar. Beef Burger has just about everything you could want in a Southern burger place. Cheerwine? Check. Corn nuggets? Check. Salmon burgers? Uh . . . sure. You may not want all 16 variations on the box meal, including vegetarian alternatives, but someone does. Apparently. Beef Burger, on West Lee Street in Greensboro, is the quintessential Southern burger place. View a larger version. Cheap Eats is a new bimonthly feature about the best, the greasiest and the cheapest fare in town. And please, don't freak out. John Batchelor has not left us. His column will now run bimonthly, alternating with Luke McIntyre's Cheap Eats. With more variety than its corporate cousins, and faster service if it's not too busy, Beef Burger will be sticking around for a while. Skip the commercialized trough and drop by 1040 W. Lee St. Help fight globalization and stick it to the man, all in the form of a saucy sandwich. And remember: Every time you bite into a Big Mac, Ronald McDonald eats a little bit of your soul. Contact Luke McIntyre at triadcheapeats@yahoo.com. The News & Record and Landmark Communications, Inc.